A Filipino teenager has died of stab wounds after he was apparently part of a brawl between among teenagers in Vancouver. Deward Ponte, 15, was a victim of a fight that between two groups of teenagers at Grays Park. Roseller Salvacion, 19, of Surrey, B.C., is now facing murder charges in connection with Ponte’s death, Vancouver police said. Another suspect, Dillan Butler, 18, from Burnaby, B.C., was charged with the attempted murder of another teenager who was with Ponte at the time of his death. A resident living close to the park also called police and reported hearing screams coming from behind a nearby home. Police found two young men suffering from stab wounds in an alley. Paramedics tried to revive Ponte, but he succumbed to his wounds. A second stabbing victim, a 19-year-old man, was rushed to hospital for treatment. Ponte, who died in the early hours Sunday, arrived in Canada years after his mother Daisy immigrated in 2000 under Canada’s caregiver program. Daisy Ponte, a single parent, hopes that moving to Canada would eventually benefit her and her two children. “But after what happened to my son Deward, now, he is dead, it seems like a better life here in Canada, it is false expectation,” Ponte said during a press conference in Vancouver. She describe Deward as a friendly, but homesick child. She added that it took a while for the family to adjust not only to a new country, but living with each other. Her experience resonates with other immigrants to Canada in hopes of better life. A study at the University of British Columbia found that Filipino youth experience an average of five-year separation from their parents who come to Canada under Citizenship and Immigration Canada’s Live-in Caregiver Program. “The kids were happy to be with me, but we didn’t make enough money,” said Daisy Ponte who works on call and can’t be at home as often as she would like, making adjustments to be with her children more challenging. 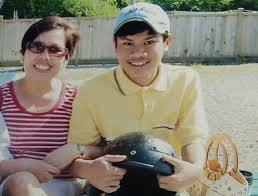 Daisy shared that it was her son’s desire to return to the Philippines to finish high school. Now that Deward is dead, Daisy Ponte plans to take her son’s remains to be buried back in the Philippines.